w00t! I'm all excited to be here in Boise. My Park City landlord got home last night and we went to the Eccles Center for the Performing Arts to see Pacifico Dance Company do Mexican music and dance. It was a nice show with a good mariachi band and great colorful dresses. This morning I packed up and headed out. It was a delightful drive. I'm worried that these monthly long drives to a new town are becoming addictive to me. I was so excited to get on the road - partially because I deprive myself of certain "road trip only" albums all month, and then I finally have carte blanche access to them in the car. Initially I selected Miles Davis Miles Ahead and it was just one of those times when your whole being is perfectly primed to enjoy that one specific record. I was loving it. 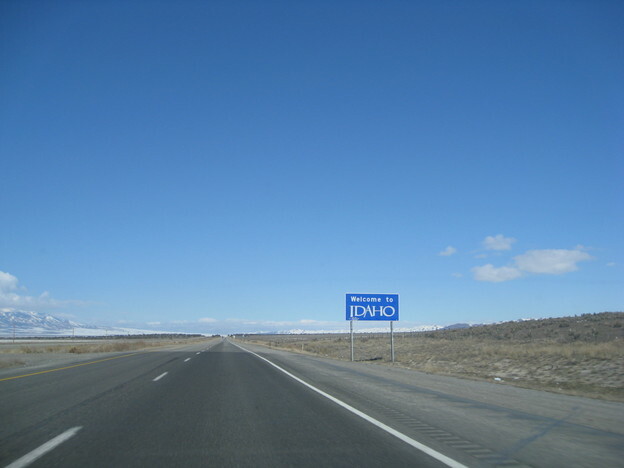 The drive is a simple straight shot on 84 West at 75 MPH the whole way, so I actually did it in one tank of gas and just under five hours. The oil change last helped and the green machine got about 35 MPG. Kate has always warned me about the perils of "The I States", but I must test my mettle. Got clouds? 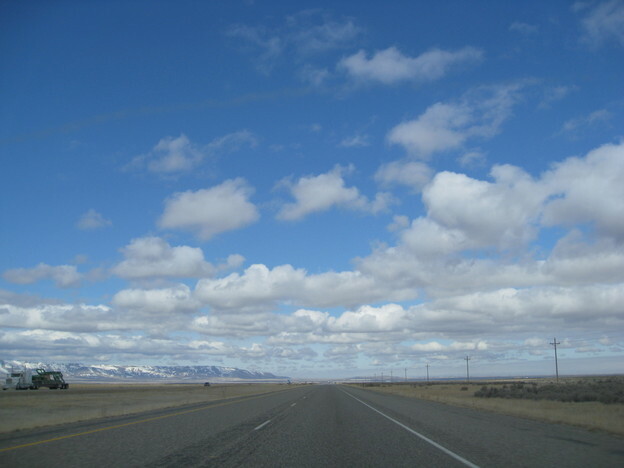 "Big Sky" is supposed to be Montana, but since Idaho's license plate is the oh-so-lame "Famous Potatoes", they should get a slogan like "Our Sky Is Also Rather Large". When I arrived I met my landlord's father Clark, who showed me the place. It's on a nice street with a real suburban feel with lawns and porches and so forth. The apartment itself is (as was to be expected) a bit of a step down from Gunter's ski house, but it's OK. It's the basement of a duplex with the landlords, who are currently in Panama, living upstairs. Of course, the Internet connection works great, which is vastly more important than anything else including heat or light. Clark was very friendly and helpful to me. Again, somehow I seem to have pretty good craigslist luck. He asked what outdoor activities I liked to do, said they would take me on a whitewater rafting trip in a few weeks, and immediately went home to get his old mountain bike, filled the tires, and lent it to me. Then he drove me around the neighborhood pointing out the pedestrian retail pavilions, bike trails, numerous parks, how to get to the skiing at Bogus Basin, etc. After he left and I made a run to get a desk and chair since the apartment didn't have anything suitable for laptop work, I took the bike out for an exploratory ride. Oh I should mention that I experienced instant spring as it was cold and piles of snow in Park City at 9am and here it was mid fifties and gorgeous Spring at 2pm. Tons of people were out walking (many with dogs), biking (two tandem bikes spotted), skateboarding (there are numerous skate parks), and playing baseball. I biked to The Green Belt, a long bike/walk path and I rode next to a golf course and the river a ways. I grabbed a copy of Boise Weekly and was giddy to discover Les Claypool (alternative metal bass genius with application for demigod status under consideration) will be playing here on Saturday. So far so good. I'm completely unpacked (takes about 15 minutes for stuff plus 30 for computers, wireless network, etc). On first impression, Boise is equivalent to the bomb.